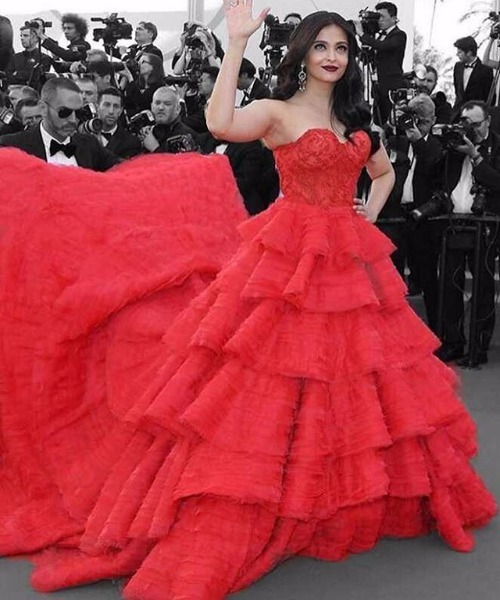 Cannes Film Festival 2017: Aishwarya Rai Bachchan in Ralph & Russo Red Tulle Gown Look Sizzling Hot! Bollywood actress Aishwarya Rai is the quintessential lady at Cannes and her back to back stunning appearances are a proof. The actress has always wowed everyone with her fashion picks and this year again, she is back with the same magic. The beauty has made sure to not let her fans get disappointed. Day 1: Cannes Film Fest 2017: Aishwarya Rai Bachchan Stun On Red Carpet In A Cinderella Inspired Blue Gown! The queen is back to mesmerize us with her yet another eye-grabbing look. Yesterday, Aishwarya Rai Bachchan walked the red carpet in a beautiful blue Cinderella-inspired ball gown. The actress has taken her style game a notch up for her second look at Cannes Film Festival. The stunner steals the show with her second appearance on Day 4 in Ralph and Russo red gown. Aish carried her red hot ruffled number with a fitted corset-styled bodice, a rich berry lip shade, and statement diamond earrings. This look of her will make your heart skip a beat. Talking about her first look from day 4 for photo call, Aishwarya Rai Bachchan picked an off-shoulder black, dramatic gown from Ashi Studio. She complimented it with bright orange lip shade, winged eyeliner and eye shadow in turquoise. From Yanina Couture to a Mark Bumgarner gown, Ralph and Russo to Monisha Jaising, Aish is slaying it like a boss! Day 1 & 2: 15 Stunning Looks of Deepika Padukone At Cannes 2017 That Can Swoon Anyone! Previous : Lisa Haydon & Dino Lalwani Blessed With Baby Boy, Shares First Adorable Picture!